Making spooky edible crafts from candy is a fun Halloween activity for the whole family. You can make eyeballs, spiders, or even ghosts. A cool ghost craft is dipping strawberries in white chocolate and then drawing the eyes and mouth with dark/brown chocolate. You can also make creepy food which is not candy, such as pastries, mummy pizza bites, eye soups, or a meat loaf that looks like a burnt hand. If you want your children eating healthier this Halloween, you can carve a mouth with vampire teeth from a 1/4 of an apple. 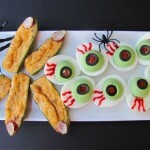 Below you will find many other ideas for tasty Halloween treats.